New MySpace: Justin Timberlake relaunches social network as "artist community." Hot New Facebook Alternative: MySpace? 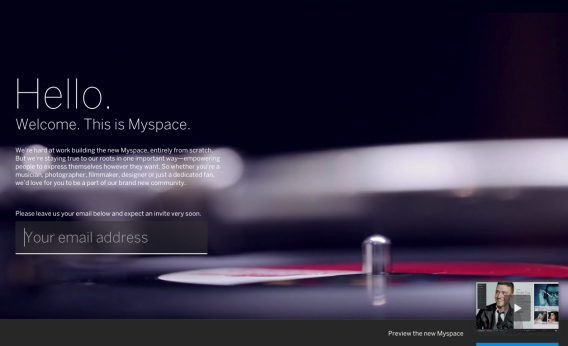 MySpace’s latest redesign is actually drawing some positive attention to the long-ridiculed site. You know the story. The world’s leading social network becomes littered with ads and marred by spam and privacy intrusions, eventually giving way to a cleaner, simpler, more aesthetically appealing alternative. Yes, Facebook had better watch out for a scrappy little upstart rival called MySpace. OK, MySpace isn’t actually going to be challenging Facebook for social-network supremacy anytime soon. But the mid-aughts relic is relaunching soon, with a visually arresting interface that makes Facebook look stodgy and dated by comparison. The redesigned site, which scrolls horizontally and seems to borrow liberally from the image-sharing network Pinterest, was unveiled Monday night in Los Angeles by co-owners Chris and Tim Vanderhook and new investor Justin Timberlake. The Vanderhooks bought the nearly moribund site in June 2011 from Rupert Murdoch’s News Corp. for just $35 million, after News Corp. paid more than half a billion for it in 2005. Its new incarnation moves a step further away from its roots as a one-stop social network for the masses. (Notably, it appears to ask users to log in via either Facebook or Twitter rather than building their own profiles from scratch.) Instead, it’s going to focus more narrowly on becoming a social home for musicians, artists, celebrities—and their fans. Timberlake’s role will be to promote the site not only to the public, but to his buddies in Hollywood, according to The Hollywood Reporter. I’m skeptical that the world needs another way for celebrities to express themselves to their fans, and the fact that the new MySpace appears to emphasize a laptop/desktop experience as opposed to a mobile interface could hamper its growth. If nothing else, though, the attention it’s getting is evidence that there’s a growing appetite for a Facebook alternative, given the spotty privacy record and decreasing cool factor of Zuckerberg’s site.